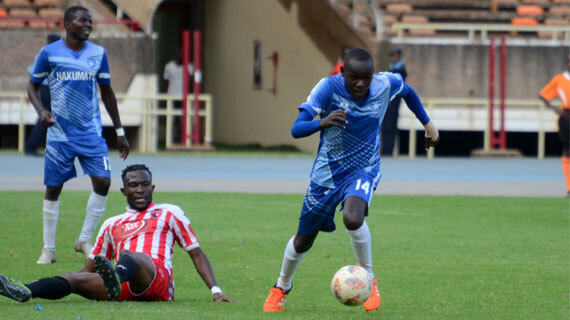 Kenyan Premier League side Nakumatt FC survived the relegation axe after beating Second tier side Ushuru FC 2-0 at the Kasarani Stadium on Sunday evening in the KPL promotion and relegation play-off. Joe Waithira’s brilliant double gave Nakumatt a relief as they won the game 3-0 on aggregate having won 1-0 in the first leg last week. Nakumatt were in to get into the lead early and they pressure from the first minute. Their persistence paid off after 22 minutes when Waithira delightfully chipped the ball over the keeper after receiving a pin point pass from Timonah Wanyonyi. Nakumatt continued to dominate with Ushuru failing to get any meaningful effort at goal. In the 33rd minute, the KPL side had a chance to stretch their lead when Moses Odhiambo’s corner fell in Eugene Ambulwa’s path, but the defender’s powerful header went just wide. Ushuru had their first chance at goal after 34 minutes, when substitute Max Ravel picked the ball at the edge of the six yard box one on one with the keeper, but he couldn’t hit the target, the ball coming against the post. They were almost punished four minutes on the turn when a swift move from Nakumatt saw Odhiambo release Cornelius Juma on the right, but the striker shot wide from inside the box. The taxmen came back a better side in the second half. In the 52nd minute they had a chance when Bill Oporia’s cross was met at the backpost by Ekaliani Ndolo, but his effort came against the side netting. Two minutes later, Oscar Mbugua came close when he shot from the edge of the box on his weaker left foot, but the effort sailed over. Nakumatt made changes, John Avire and Harun Nyakha coming on for Clinton Kisiavuki and Odhiambo. But Ushuru kept their surge looking for an equalizing goal. In the 67th minute, they were inches close to drawing level when substitute Alex Sunga raced on to a ball from Nelson Marasowe, lifting the ball over the advancing keeper but the effort went inches wide. Again, Sunga twice came close, first with a rasping shot from distance which kissed the upside of the crossbar while his second, a dipping header from a corner landed on the roof of the net. It was Nakumatt who would have the last laugh, Waithira striking the second and the stroke of halftime with a little dink over the keeper from Wanyonyi’s pass.